It’s nice to hear when somebody likes what you’ve done, and writing is no exception. You have to throw your child into the darkness, and hope. Just West of Clovis appeared in the Anthology, Out of the Storm in 2015. 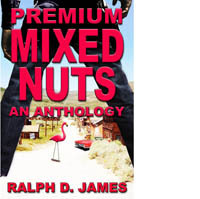 It’s out of print now, but Clovis has resurfaced in my anthology, Premium Mixed Nuts. I’ve separated the reviews by their anthologies.